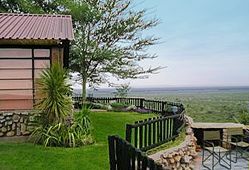 At Aloegrove Safari Lodge hosts pride themselves in putting you, the guest, first. From the word go, you will receive true Namibian hospitality, and unparalleled service to ensure that you will return again and again. Sample our superb cuisine in excellent dining facilities with open fireplace or outdoor braai. Aloegrove is known for its unique hospitality. Hosts specialize in small private groups of maximum 10 guests, who each and everyone will receive undefined personal attention. 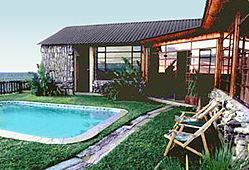 Guests are accommodated in 5 en-suite bungalows, each with its own balcony. A resident beauty therapist is also available for that much sought-after massage! 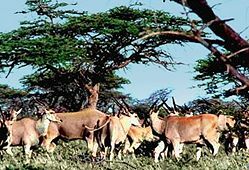 Game Viewing: Join ranger for a sensational wildlife experience, viewing several game species, such as: Eland, Kudu, Oryx, Giraffe, Mountain Zebra, Hartebeest, Springbuck, Impala, Steenbuck, Duiker, Damara Dik-Dik and of course the scurrying Warthog. Lion, Leopards & Cheetah: hosts invite the more leisurely guest to watch the daily Lion, Leopard and Cheetah feeds, experiencing the king of the wild at close range. Bird watching: A picturesque view from each Bungalow, overlooking a waterhole makes the watching of birds an extraordinary experience. Hiking Trails: For those who would like to venture out on one of many hiking trails, the experience will be truly memorable! While sitting by the fireside, you might hear the roar of the Lion. Both morning and evening game drives, with Lion, Leopard & Cheetah feeding.